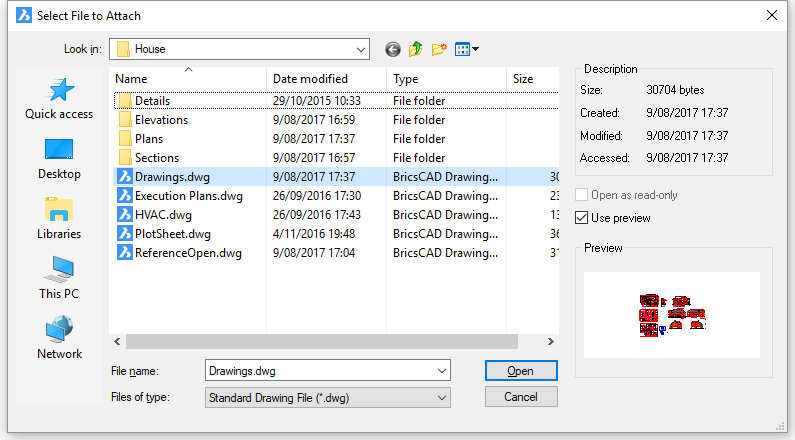 Attaches DWG files to the current drawing through the command bar (short for "external reference"). The XDWGFADECTL system variable sets the fading of external references. Values between 0 (no fading) and 90 are accepted. If necessary, press F2 to view the full list. See TextScr command. Externally referenced drawing(s) to insert - enter the names of one or more xrefs; separate multiple names with commas. Externally referenced drawing(s) to bind - enter the names of one or more xrefs; separate multiple names with commas. This option is hidden, but you can type i or insert at the command prompt. Externally referenced drawing(s) to detach - enter the names of one or more xrefs; sSeparate multiple names with commas. Detached xrefs are removed from the drawing, and are no longer displayed. Use the Attach option to reattach them. Click Open. The New Location for XREF dialog box repeats for each xref named. When the path is incorrect, the program cannot display the xref, so use this option when the source DWG file is located in a different folder or on another computer. Use this option when the source DWG file has changed, and you want to see the updated drawing. This option keeps the links to the source DWG files, and hides the display of xrefs in the drawing. Overlays xrefs in the current drawing; displays the Select File to Overlay dialog box. Attaches xrefs to the current drawing; displays the Select File to Attach dialog box. Overlay and Attach operate the same way. The difference is in how they treat xrefs that have xrefs themselves (nested xrefs). Overlay -nattaches only the first level of xref, nested xrefs are not attached. Attach - attaches all xrefs, including nested xrefs. Select the xref. Notice that it has one grip at its insertion point. Drag the grip to move the xref. XAttach - attaches xrefs through a dialog box.